Mikkeller Mexas Ranger - AoM: Beer et al. 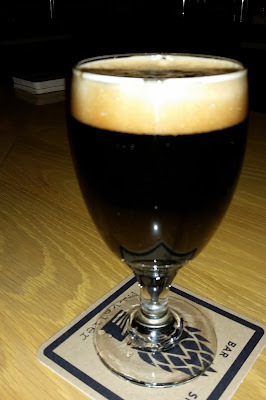 After the Jolly Pumpkin Biere de Mars, here at Mikkeller Bar in San Francisco, I decided to have the Mikkeller Mexas Ranger. It had a thick head and a pitch black color. 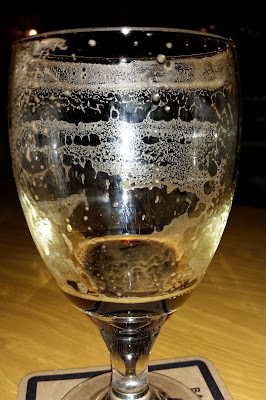 Upon smelling the beer, I got the usual stout notes out of it and maybe detected a bit of the chili. I don't know, however, if I would have detected the chili from a blind taste test, but it certainly smelled different from a typical beer. Furthemore, it smelled more like the chili stouts I've had than the standard stouts I've had. Next I rinsed my pallet with water (served upon request, automatically comes with no ice) and proceeded to taste the beer. Despite all the mentioned ingredients, the beer mostly tasted like a chili stout. There were some other tastes, but I had trouble choosing words to describe them. Aside from malty, I settled with noting it had a strange taste and that overall I did not like it. Ale brewed with spices, almond milk, cocoa, chili, black beans & avocado leaves.